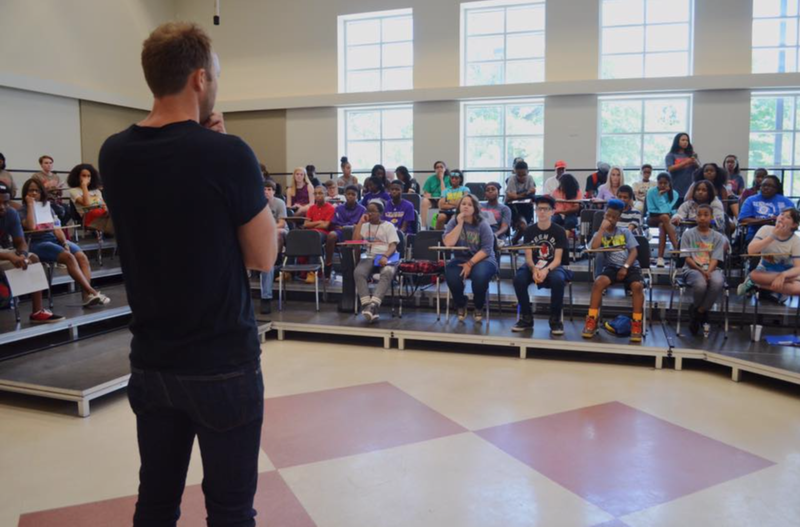 This year the Otis Music Camp celebrated 10 years of soul and music Education. 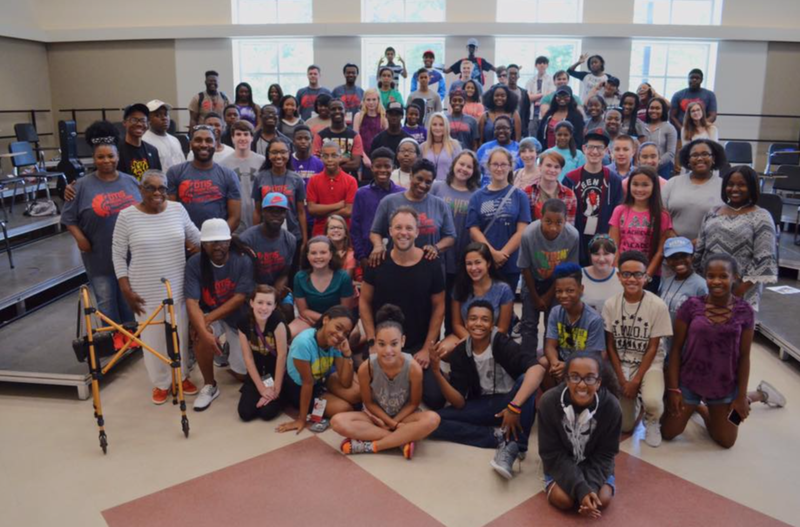 The camp hosted 60 children from throughout the state of Georgia and 34 music coaches from across the country. We are so grateful for everyone who was a part of this year's camp, it was truly one to remember. 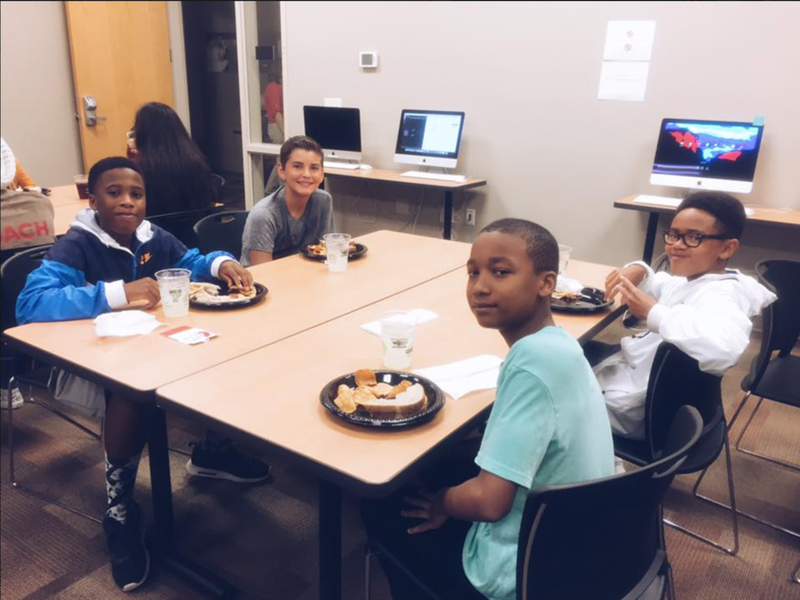 Scroll down to see photos that were taken during our two week camp. OMC Founder, Karla Redding-Andrews, introducing herself to the 2017 OMC campers on day one. Each day of camp, Coach Ted White (not pictured) taught the campers music theory. Coach Chelsea helping campers through music theory exercises. 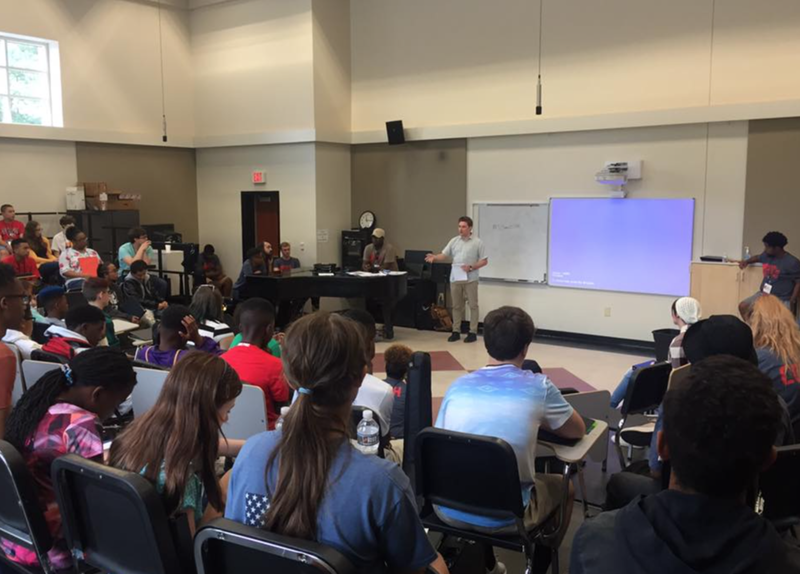 On day one campers chose the genres they wanted to learn more about and immediately headed into practice rooms. 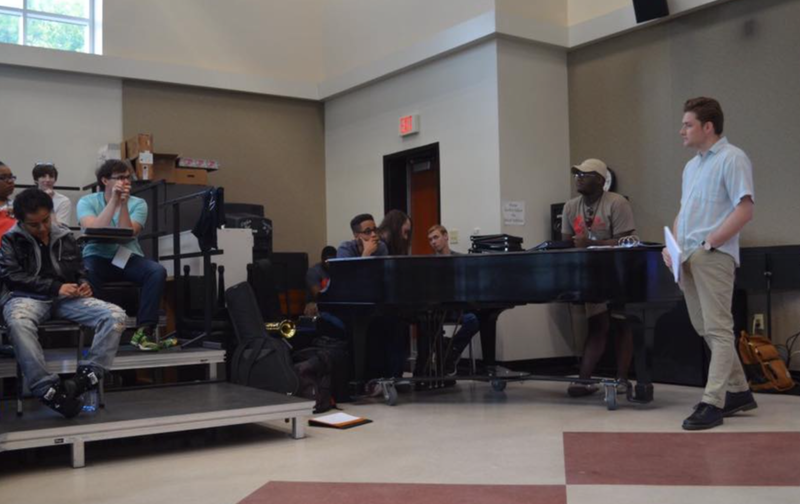 Campers chose to be part of several different genres ranging from Classical to Hip Hop. Lunch on day one was provided by The Rookery. Former camper, Thomas Young of Thirty Tigers, came down to Macon and presented to our campers. Coache Vinson and Floco talking to their group of young rappers about Hip Hop. Coach Reneé, Saxton and Joiterious with their campers in the Gospel room. Coach Ted working with kids in the R&B room. Karla Redding getting the campers ready for day two's presenters. St.Paul and the Broken Bones were on tour during camp but set some time aside to talk to our campers via Skype. Roasted Cafe fed our hungry campers on day two. Lyndsay Richardson, Miss Warner Robins 2017, presented on day 3. Coach Matt jamming with his Jazz campers. Lee M. and Sarah H. recording their song at Otis III's recording studio. Our campers were a fan of lunch on day 3. 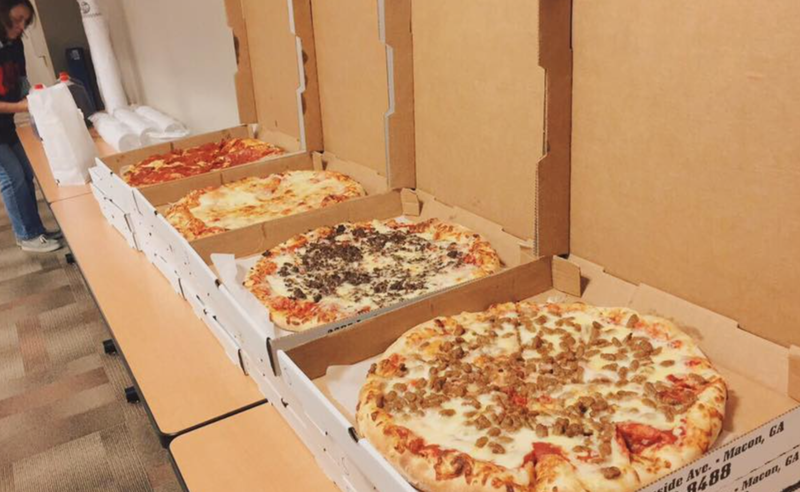 Thank you, Ingleside Village Pizza! Dance class with Coach Yancy. Coach Isaac with some campers in at Townsend recording studio. Coach Ted teaching music theory. The campers took a field trip to The Creek, Macon's premier radio station. Kaitlyn H., live, on The Creek for the morning show. Our LongHorn sponsors pictured with Karla Redding-Andrews. On day five our campers took a field trip to the legendary Douglas Theatre for the 2017 Hip Hop Summit. Some of our coaches having some fun during our annual cook out. Mama Honey's provided our campers with delicious pulled chicken/pork sliders. David Claassen of BMI presented to our campers. Jazz room working on their song, "Jazz House Groove." Tacos and nachos were provided by Margaritas. Aaron Saxe of Jampol Artist Management presented to our campers. Karla Redding-Andrews getting the campers ready for a surprise guest. Popular musician, Andra Day, called our campers to talk them about songwriting. 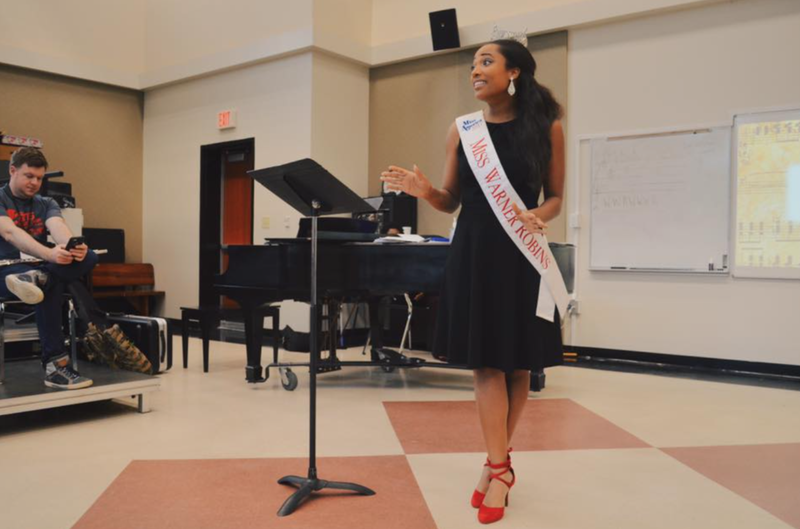 Opera singer, Jasmine Habersham, stopped buy camp and sang a song for them. Aiyisha Obafemi of Disturbing Tha Peace Records presented to our campers. She educated our campers about the music industry and even rapped for us. Some of our sponsors and board members stopped by and ate lunch with the campers. H&H served our campers delicious Southern food. Coach Jayme taking campers through vocal warm ups. Campers performing their song during the master class. 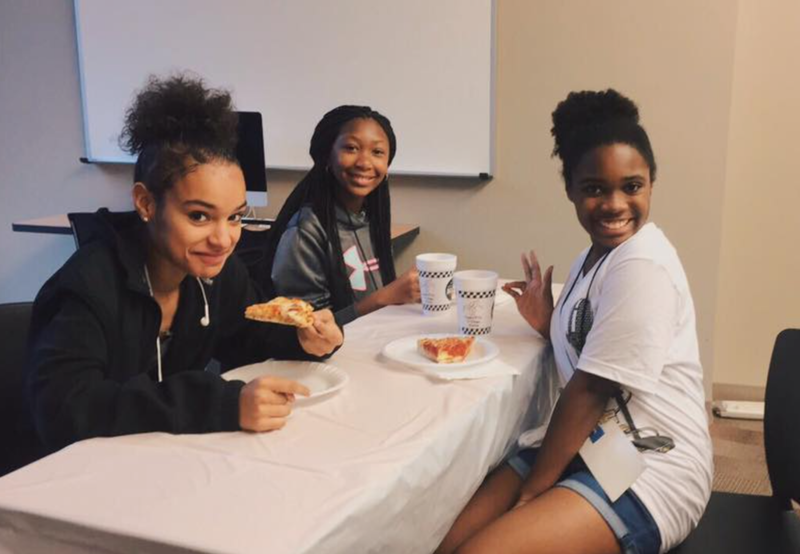 Carrabba's Italian Grill not only served us wonderful food but they served our campers with kind smiles. Campers getting some stage practice in. The campers had a "fine-dining" experience on day 9 of camp. The Back Burner provided us with a delicious two course meal. Campers made last minute touch ups before heading to the Cox Capitol Theatre for the Grand Finale that was later that night. Campers finished recording their songs in the Townsend recording studio with Coach Isaac and Zelma Redding. We would like to extend a big 'thank you' to all of our wonderful sponsors! From sponsoring the camp to providing food for our campers and coaches each day, we are extremely grateful for all of your efforts in making Otis Music Camp 2017 phenomenal. We could not do this without your support.